A member of a silent order of Cistercian monks on Baldey Island off the Pembrokeshire coast has criticised the Abbey for what he describes as ‘cruel and demeaning’ punishment after he was heard speaking during a forbidden period. 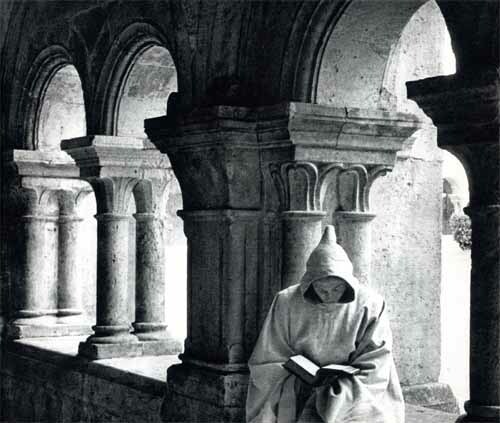 The ancient order permits its monks to utter just one word every ten years. But the Abbey claims that Brother Emeritus Flaherty said ‘Thank you’ when handed a bowl of cold fish bone soup at supper, a careless slip which used up his speaking allowance until 2038. Brother Flaherty answered questions posed by our religious affairs correspondent Fay Goodenough with handwritten notes pushed under the Abbey front door. In these, he complained that he was no longer allowed a plank to sleep on and that his wifi connection had been reduced to only 2mbs. As Fay left the Abbey she called under the door to thank Father Flaherty for his time and unfortunately he was heard to reply ‘You’re welcome,’ followed by ‘Oh bugger!’ He will now not be permitted to speak until 2078.